The Market Report: Snapshot: SuperFresh Irvington! Store-baked chocolate chip cookies. They look amazing - 2/$2.00. Roasted Korean seaweed snacks whose ingredients are seaweed, canola oil, sesame oil, and salt - $1.49. 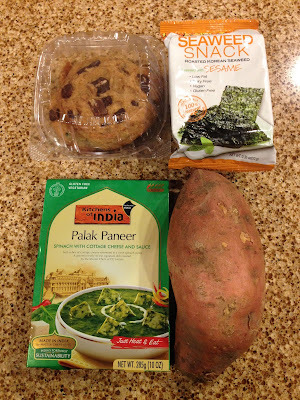 A ready-to-eat dinner for two--or so it says--of palak paneer (an Indian dish that includes cheese cubes in a spinach sauce) with no preservatives but that was actually made in India - $4.19. A jumbo yam (which is actually different from just a big regular yam, apparently) - $0.59/lb. Plus, the manager is fantastic. I'm not entirely sure if the guy I saw today is manager/owner James Lee, but he was a young Korean man -- extremely nice, to both customers and employees, and very actively involved in running the store. There was absolutely none of the usual tension between the primarily Korean management and primarily African-American employees and customer base, as described in the book I'm reading right now! I wish them luck!